As women are searching for more reliable ways to lower their chances of getting pregnant, tubal ligation often appears to them as an attractive and convenient birth control option, particularly for those who already had children and are set on not having more. Though tube tying is acclaimed for its effectiveness, it is not a foolproof method of contraception, leaving many women wondering how common is pregnancy after tubal ligation. Continue reading to learn everything about pregnancy after tubal ligation, including can you get pregnant if your tubes are tied and what your options are if you actually want to conceive after tubal ligation. This form of permanent birth control works by blocking, tying, or cutting the fallopian tubes to prevent the sperm from reaching the egg. Most commonly, the procedure is performed laparoscopically, through a small incision in the abdomen, on an outpatient basis. Tubal ligation might also be performed after a Cesarean section delivery if a woman is certain she does not want to have more children. Tubal ligation is considered a very effective form of birth control; however, it is not 100% effective for all women. Although very small, there is a 0.5% chance of pregnancy after tubal ligation, which means that less than 1 woman out of 200 will conceive. This failure rate typically results from improperly performed procedures or a spontaneous regeneration of the fallopian tubes over time. The latter is more likely among younger women, especially those undergoing a tubal ligation in their 30s. Although tubal ligation is considered a permanent method of birth control, some women desire to have children later on. In certain cases, it might be possible to restore a woman's fertility and enable her to get pregnant through a reversal surgery. Tubal ligation reversal is a procedure aimed at reattaching the fallopian tubes so that the egg can be fertilized by the sperm upon ovulation. The reversal procedure is usually a more complex surgery than the ligation itself. 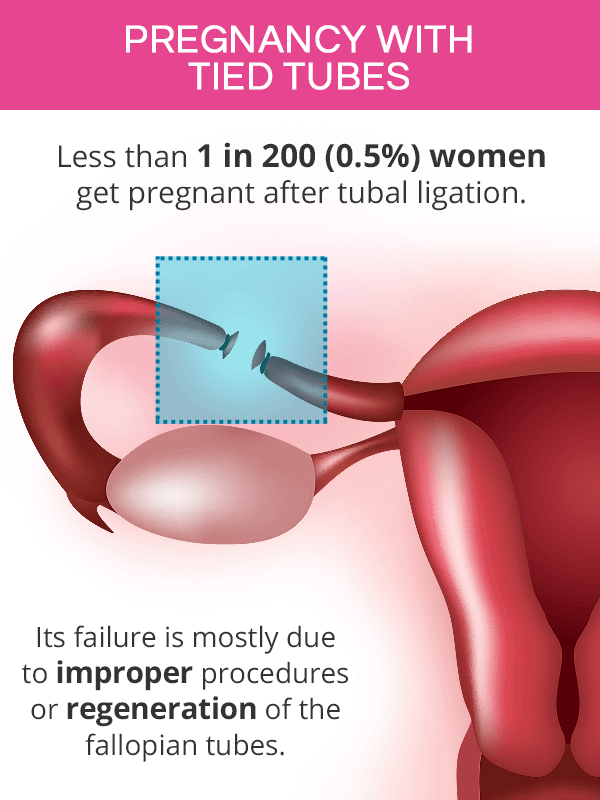 The highest rates of pregnancy after tubal ligation reversals occur when the tubes were initially clipped or tied, as opposed to being cut or burned. It is estimated that 25% to 80% of women successfully get pregnant after the reversal procedure, which depends on the type of tubal ligation originally done, maternal age, and health status, among other factors. However, there is a 33% risk of an ectopic pregnancy if conception does occur after tubal ligation reversal, which means that the egg is implanted in the fallopian tubes and cannot progress into a healthy pregnancy. Undergoing a tubal ligation procedure may seem like the ideal form of birth control for many women, particularly those who already had children and do not plan on having more in the future. It consists of surgically blocking, tying, or cutting the fallopian tube to prevent fertilization of the egg by the sperm. While generally around 99.5% effective, tubal ligation is not foolproof. 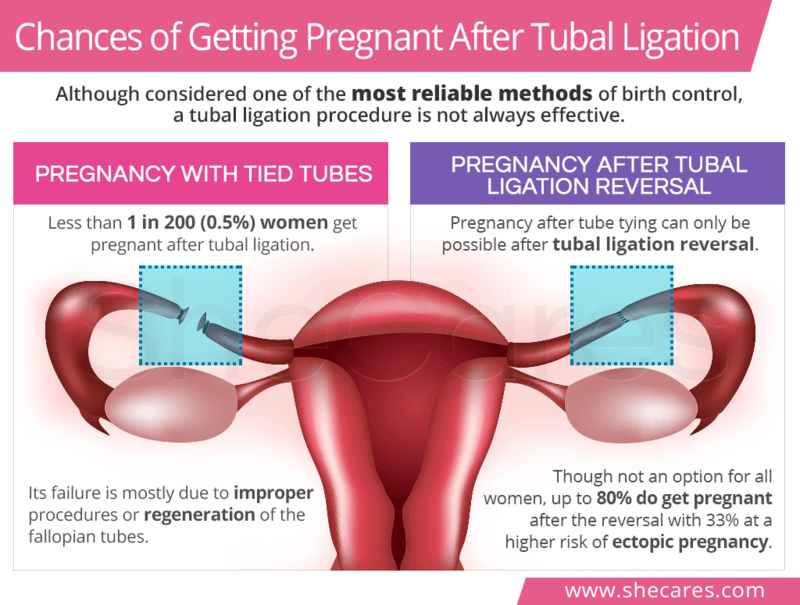 Due to the risk of an incomplete closure or regeneration of the tubes, women still have slight chances of pregnancy after tubal ligation (0.5%). 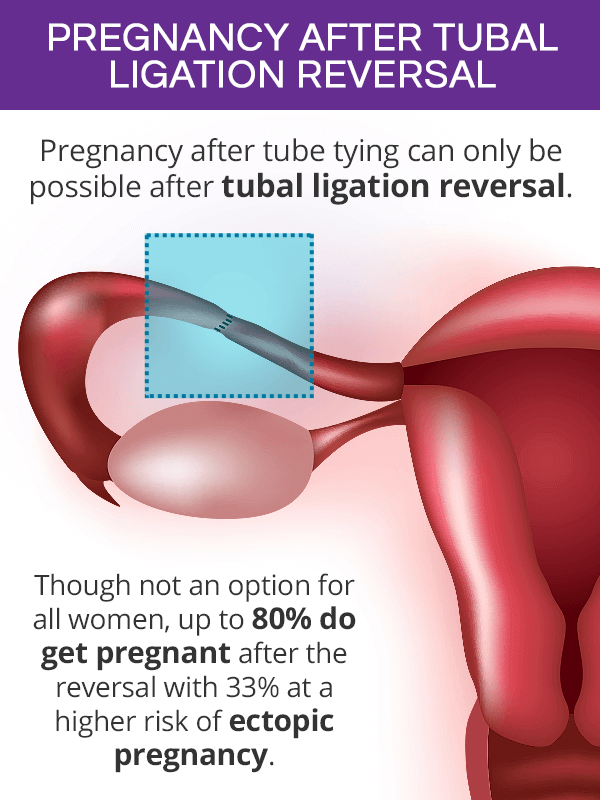 Those who consider pregnancy after tubal ligation might only be able to do so through a reversal procedure designed to reconnect the tubes to enable fertilization. However, the procedure is not an option for all women with about a third of conception cases ending in ectopic pregnancy.